Start using aroma massage oil to help you get rid of cellulite just by giving yourself an aroma therapy massage at home without even leaving your living room. How do I get rid of cellulite naturally? An aroma massage more formally known as an Aroma Therapy Massage using the detoxification powers of aroma oils may be just what you need to get rid of cellulite naturally at home. When it comes to getting rid of cellulite the natural way there are many things you can do including giving yourself an aroma oil massage in you spare time around the house. The massage-aroma synergy makes it possible to fix hard to reach areas of your body troubled by unwanted cellulite spotting. In this detox Slism, we introduce aroma massage oils to detox your body helping you get rid of that cellulite that you've been worrying about so much lately presenting essential aroma oils with their intended uses giving you just what you need to give yourself an aroma massage right at home. An aroma massage is a massage that makes uses of aroma oils to flush out potentially harmful toxins built up in your body helping you detox the natural way. In order to get rid of cellulite, it is important to understand the many Causes of Cellulite threatening to ruin your skin in order to detox more effectively to stop leg swelling. The detoxification effect does mare than help you slim down your body. When it comes to getting rid of cellulite you can count on the aroma massage detox to pull you through cellulite free. In order to get the most out of your aroma massage oil detox you are going to need to know which aroma massage oils work to fit your needs especially when using for getting rid of cellulite on legs or on bum. Choosing the right aroma massage oil may make or break your aroma massage therapy not to mention aroma detox. Getting the massage detox you are looking to achieve when getting rid of cellulite on thighs and arms depends solely on your technique and the aroma massage oils you use. 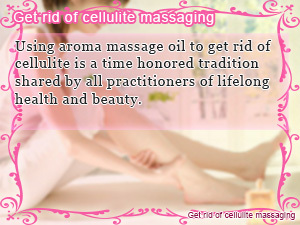 For people using home remedies for getting rid of cellulite such as an aroma massage, there is a learning curve. As much as you want to get rid of cellulite fast, it may take some time for the results to sink in. Most importantly, it is important to continue doing it regularly for best results. The aroma oils used in aroma massage therapy differ in effect and fragrance across the board. The alternative medicinal uses of aroma oil includes: recovery from fatigue, releasing of frustration, fixing body problems such as bad skin, and overall mind and body health that you can expect to more from with the right aroma oils to get you there. Fragrance in grapefruit essential oil acts as an uncoupling agent telling your body to send out uncoupling protein to burn fat more efficiently. Relieve constipation and diuretic effect on the body. Good at getting rid of pimples and other unwanted artifact on skin. Fix poor blood circulation; brighten complexion, and best overall aroma oil skin care treatment. Prevent overeating and treat skin. Boost metabolism making it easy to lose weight. Expel gas from intestines treating constipation as well as clearing up skin. Treat dry skin sticking a needle in your skin for healthy bowel movements. Burn even more fat blending with grapefruit essential oils for best results. When using aroma oil to massage your body, using aroma oil straight from the container you bought it in is not recommended. The first step is to make it! - For best results give yourself an aroma massage following a relaxing bath is highly recommended. Take a bath or shower removing lose dirt that is going to get in the way of your aroma massage cleaning your body. Remember to properly wipe yourself down with a dry towel before proceeding to the next step. Wash your hands thoroughly with soup. For people with long finger nails, clipping your nails is not required but may help you give yourself a better aroma therapy massage at home. Aroma massage therapy is not recommended to pregnant woman or otherwise people with sensitive skin likely to react to essential aroma oils in an undesired way. Please consult with you physician before starting to do aroma therapy at home. The oil that you use to massage your body is actually a diluted form of aroma oil. As a rule of thumb aroma massage oil needs to be diluted down to 1 percent essential aroma oil content. The table below gives examples of how many drops of essential aroma oil you should be using to make your own massage oil at home. Note: A drop of essential aroma oil is approximately 0.05mL. Rub massage oil into your skin around your stomach, thighs, buttocks, calves, upper arms, face (watching the eyes), shoulders, and other places such as your neck. Start with a light massage gradually putting more energy into as more and more massage oil gets soaked up by your skin. In places with noticeable cellulite, massage more thoroughly. Even after massaging your body, refrain from removing the aroma oil from your body for at least 8 hours. This is one reason why you should bathe before starting aroma oil massage therapy. For people that experience a painful burning sensation around the body, don't hesitate to wash up cleaning off aroma oil from your body right away. When you are looking to get the best detox from dieting, exercising, and giving yourself an aroma therapy oil massage at home, it's best to try many different methods. For example, the Water Detox Diet is a great way to flush out toxins stuck in your body simply just by drinking water. It may be hard at first but once you get the rules down you can detox your body without even thinking about it. Are you so sure you don’t need to detox? Check again. If you’ve check of any one of the items on the detox checklist then you need it right now. 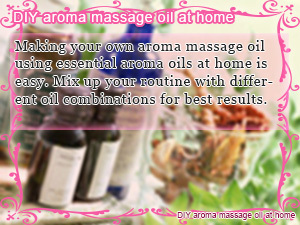 Making your own aroma massage oil using essential aroma oils at home is easy. Mix up your routine with different oil combinations for best results. 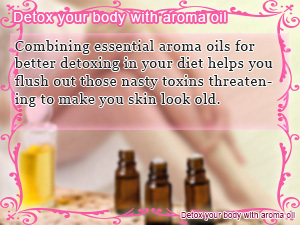 Combining essential aroma oils for better detoxing in your diet helps you flush out those nasty toxins threatening to make you skin look old. Using aroma massage oil to get rid of cellulite is a time honored tradition shared by all practitioners of lifelong health and beauty.